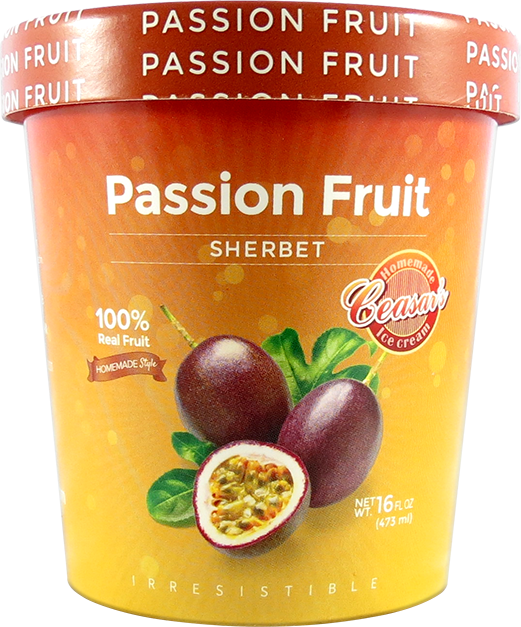 Our natural passion fruit ice cream can give you that cozy sensation that takes you back to the most special moments of your life. Passion fruit, water, sugar, corn syrup, salt, citric acid, dextrosa methyl cellulose, carob bean gum, guar gum, haraya gum, artificial color and pectin. From the moment you indulge in our Passion Fruit ice cream, the softness of its pulp opens up a path of sensations that can hardly be described as it sends a stream of pleasure to your palate. You can’t help the feeling of being in paradise on a tropical island as you watch the palm trees sway, and your quest for adventure is triggered almost instantly the moment you enjoy a sweet, yet slightly tart ice cream like ours.